Sure Signs Spring is Coming! Cherry blossoms are a sure sign of spring. They are blooming late this year due to the especially cold winter, but the wait is worth it! Washington D.C.’s cherry blossoms are in full bloom. For healthy cherry trees, use a well-balanced fertilizer that contains potassium, phosphate and nitrogen. But avoid heavy fertilization of cherry trees during their blooming period. The redbuds are in bloom and the swallow-tailed butterflies are appearing in Florida. To attract more butterflies into your yard, grow some of their favorite plants such as zinnias and lantana. Tufted titmice are emerging. Titmice are abundant in the eastern U.S. and parts of Texas. Invite them into your yard by filling your bird feeder with sunflower seeds, peanuts and suet. Daffodils are among the earliest arrivals for spring, often pushing their way up through the snow. Daffodils and crocus are pushing through frost-covered ground. Their leaves nourish the bulbs for the next year. Resist the urge to cut away their foliage until it is completely brown and withered. Frogs, salamanders and other amphibians are migrating into ponds and puddles. They are mostly nocturnal. Be cautious and watch for them crossing the roads as you drive at night near bodies of fresh water. 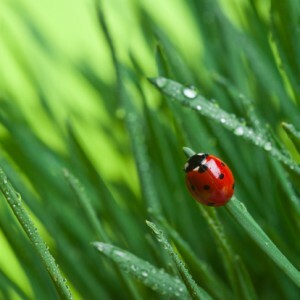 Beneficial insects such as the lady bug start to make their appearance. Encourage these type of good bugs to naturally fend off the unwanted ones. using pesticides early in the season. Give the ladybugs first dibs on your unwanted insects. Spring is also the perfect time to begin preparing your lawn for active, outdoor living. Below are tips for keeping your lawn looking great the whole season through! Lawn Basics: Getting Ready for Spring!